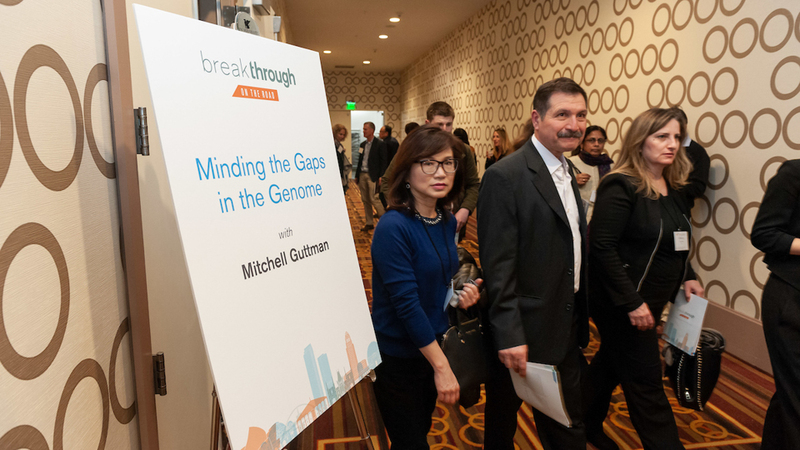 On February 9, more than 300 Caltech alumni, Associates members, and other friends gathered in downtown Los Angeles for a day of discovery that gave guests an opportunity to connect with each other and learn about groundbreaking work under way across campus, much of it supported by Break Through: The Caltech Campaign. 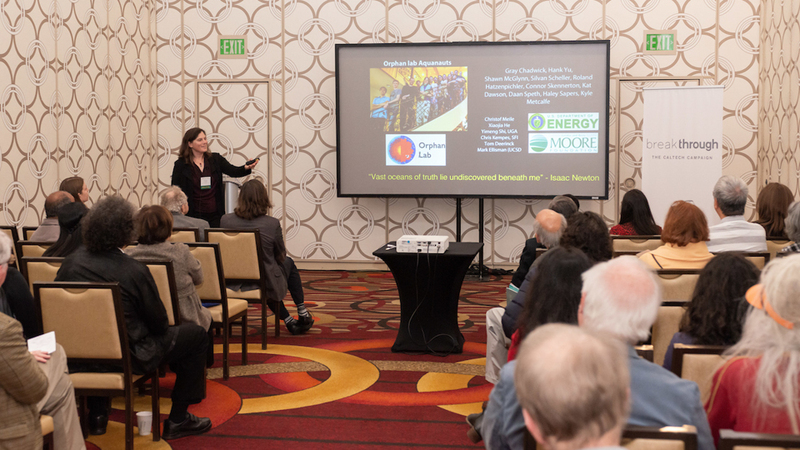 The afternoon’s “Scientific Adventures” program included sessions on efforts to ensure election integrity, illuminate the functions of noncoding genes in normal and disease states, understand microbial networks in our oceans that could have implications for climate science, and create better and more sustainable batteries. 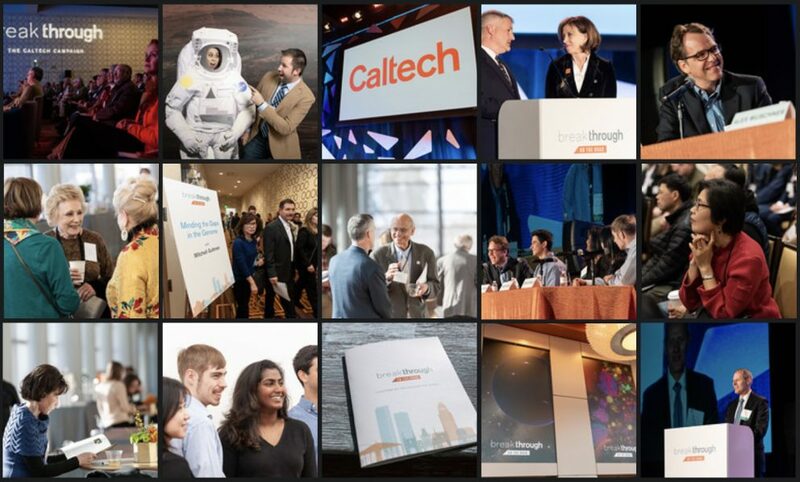 The evening presentations provided glimpses into progress on implantable and wearable biomedical devices that promise to transform medical care, the search for the elusive Planet Nine, and plans to develop robots that can perform functions ranging from restoring human mobility to exploring uncharted terrains. 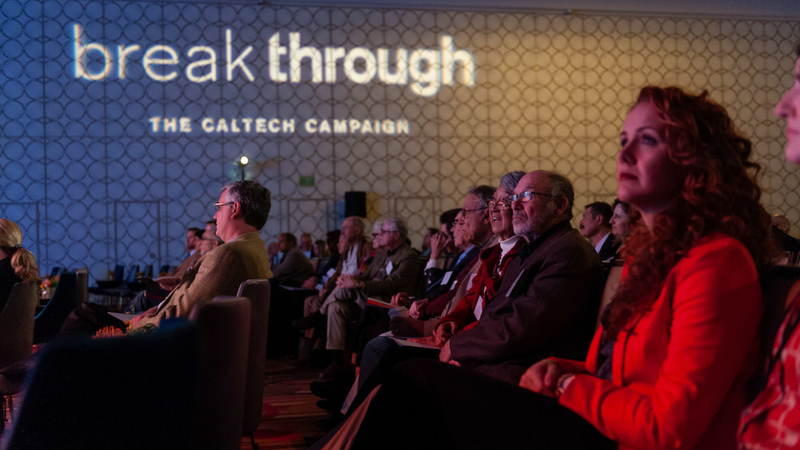 Hosted in partnership with the Caltech Alumni Association and the Caltech Associates, Break Through on the Road brought together more than 300 alumni, Associates members, and other friends for a day of scientific exploration, adventure, and camaraderie. Welcoming guests to the day of discovery were Chris Bryant (BS ’95), president of the Caltech Alumni Association, and Lynda Boone Fetter (right), board member and past president of the Caltech Associates, who reflected on their Caltech journeys and the positive impact the Institute has had on the world. The event opened with a panel presentation on the student experience moderated by Dean Kevin Gilmartin (far left). 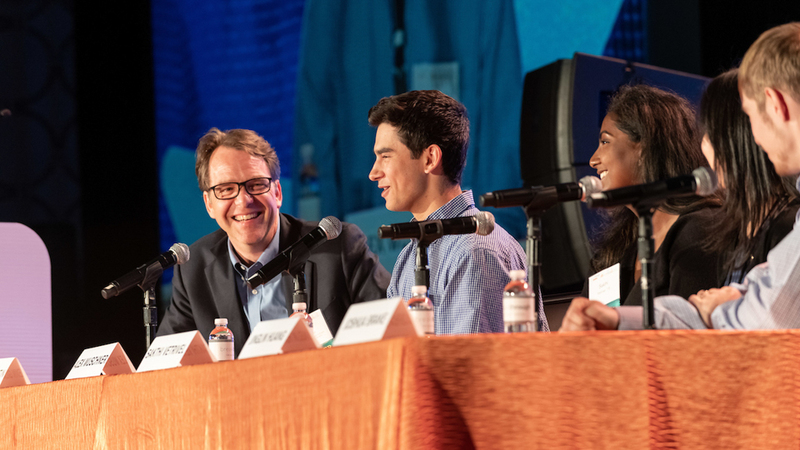 Panelists touched upon many aspects of student life, from their interactions with faculty and student mentors to their participation in athletics to Caltech’s focus on academic excellence, collaboration, and solving problems in new ways. 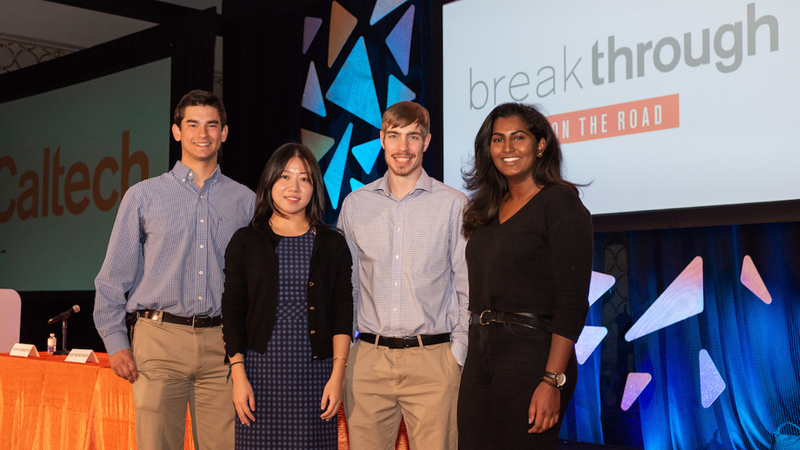 Members of the “Student Experience” panel were (from left): Alex Wuschner (class of 2020, Page House); Jinglin Huang (MS ’16), graduate student in medical engineering; Joshua Brake (MS ’16), graduate student in electrical engineering; and Sakthi Vetrivel (class of 2019, Fleming House). 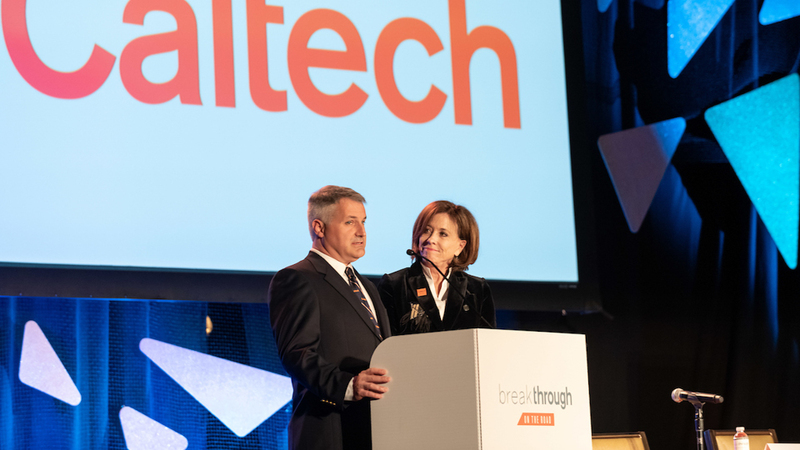 In the “Scientific Adventures” portion of the program, faculty members brought to life some of the remarkable work that takes place on Caltech’s campus every day, supported in part by the Break Through campaign. Mitchell Guttman’s “Minding the Gaps in the Genome” presentation, for example, provided a glimpse into a special and largely overlooked class of genes that do not produce proteins but are important players in diverse biological processes such as genome regulation and cellular organization. 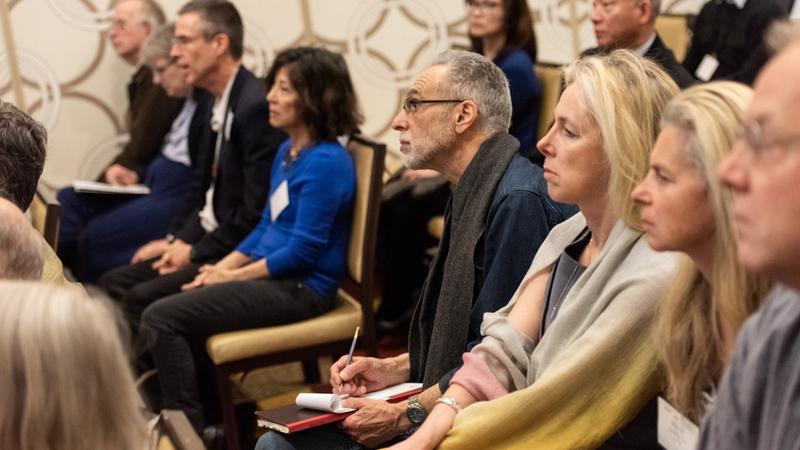 Each guest had the opportunity to attend two of four “Scientific Adventures.” Those who selected “Beyond Li-ion Batteries: Pushing the Envelope of Energy Storage” (pictured here) heard from Kimberly A. See about the challenges of developing new chemistries that have the potential to provide better performing and less expensive cells than lithium-ion, the current status quo for rechargeable batteries. Participants in R. Michael Alvarez’s talk on “Securing Elections” learned about an evidence-based approach for assuring confidence in elections. Alvarez and his team partnered with the Orange County Registrar of Voters to collect and analyze massive amounts of data related to the 2018 general elections in Orange County. The project included an online election-integrity dashboard with statistics and analytics related to voter rolls, large-scale changes in voting behavior, and firsthand reports about problems and wait times at polling places. In her “Scientific Adventure,” Victoria J. Orphan took on the topic of “Understanding the Invisible Microbial Networks that Shape Life and Biogeochemistry of Our Oceans.” Orphan described how she and her team investigate marine microorganisms to learn how they interact with each other and their environment to play a role in methane cycling and carbon sequestration. 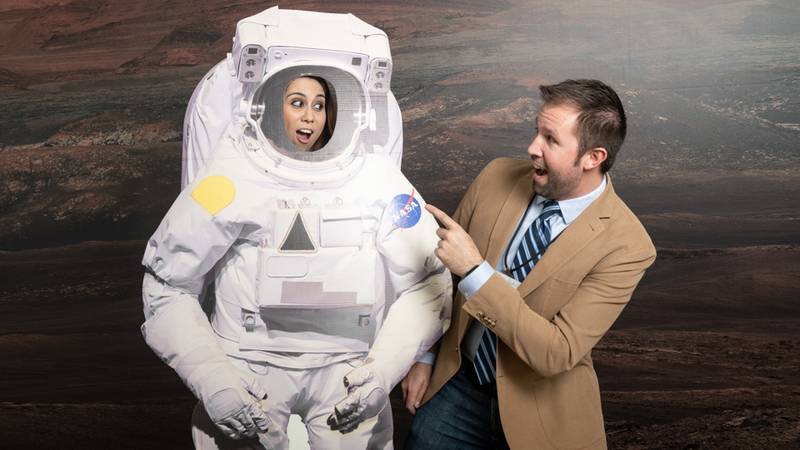 Break Through on the Road attendee Michelle Chavarin (in spacesuit) and Kevin Noertker (BS ’09), a Caltech Alumni Association board member and event volunteer, were among many guests who took the opportunity to pose in front of a panoramic Mars photo wall. The wall was a mosaic of dozens of images taken by the Mars Curiosity rover’s Mast Camera looking uphill at Mount Sharp. 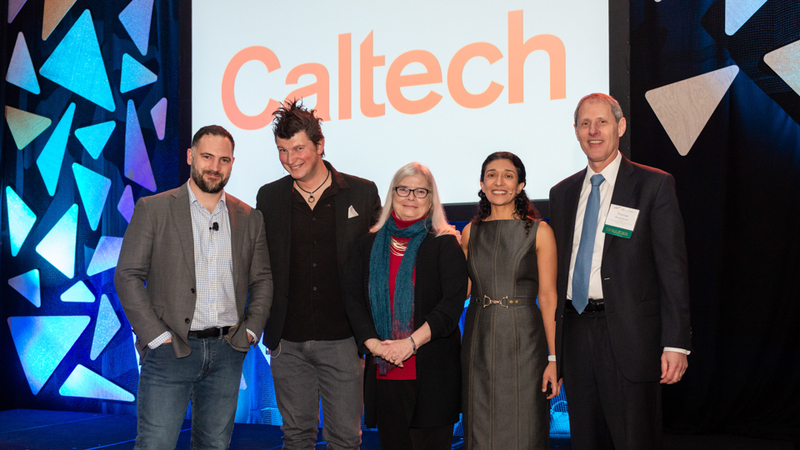 Evening presenters were (from left): Aaron Ames on “Making Sci-Fi Robots Real”; Konstantin Batygin (MS ’10, PhD ’12) on “The Hunt for Planet Nine”; Caltech trustee Louise Kirkbride (BS ’75, MS ’76) on her experience as one of the first freshman women to enroll at Caltech; Azita Emami on “From Sensing to Intelligence: Building a Healthier World”; and President Thomas F. Rosenbaum, who spoke about the power of big ideas at Caltech. 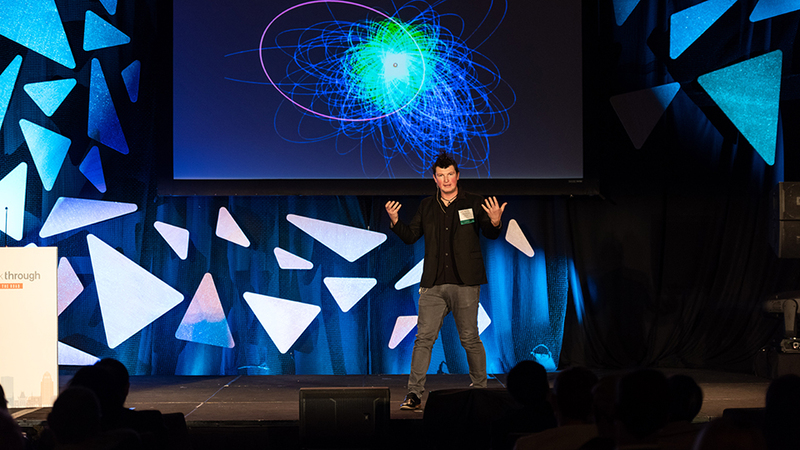 In 2016, Konstantin Batygin (MS ’10, PhD ’12) and Caltech astronomer Mike Brown captured global headlines with the announcement of an as-yet-unobserved ninth planet in the outskirts of the solar system. Batygin described how he and Brown continue to refine their simulations and learn more about the planet’s orbit, in addition to their actual search for the elusive Planet Nine. 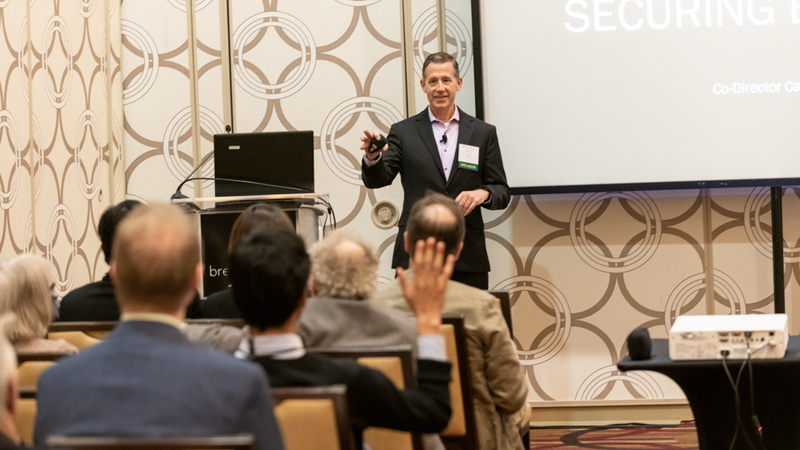 In addition to presentations, the program included two receptions where guests enjoyed refreshments and mingled with speakers, event volunteers, and other participants. 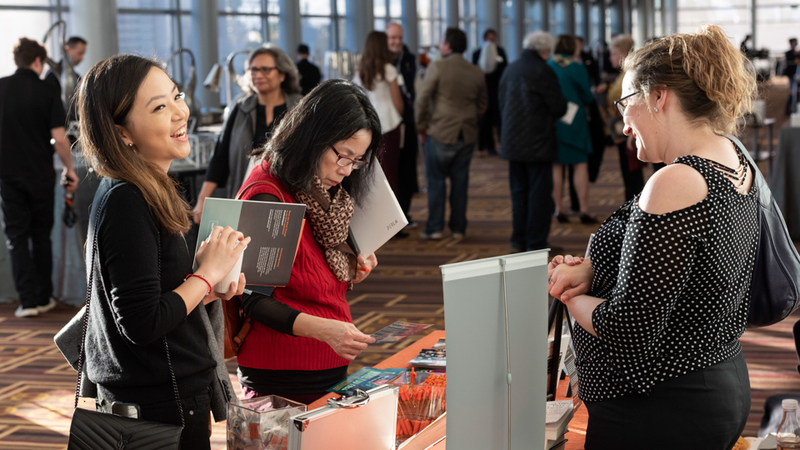 The Caltech Alumni Association and Caltech Associates also sponsored a table where participants could engage with alumni and friends and learn about upcoming opportunities to support the Institute and foster their Caltech connections.